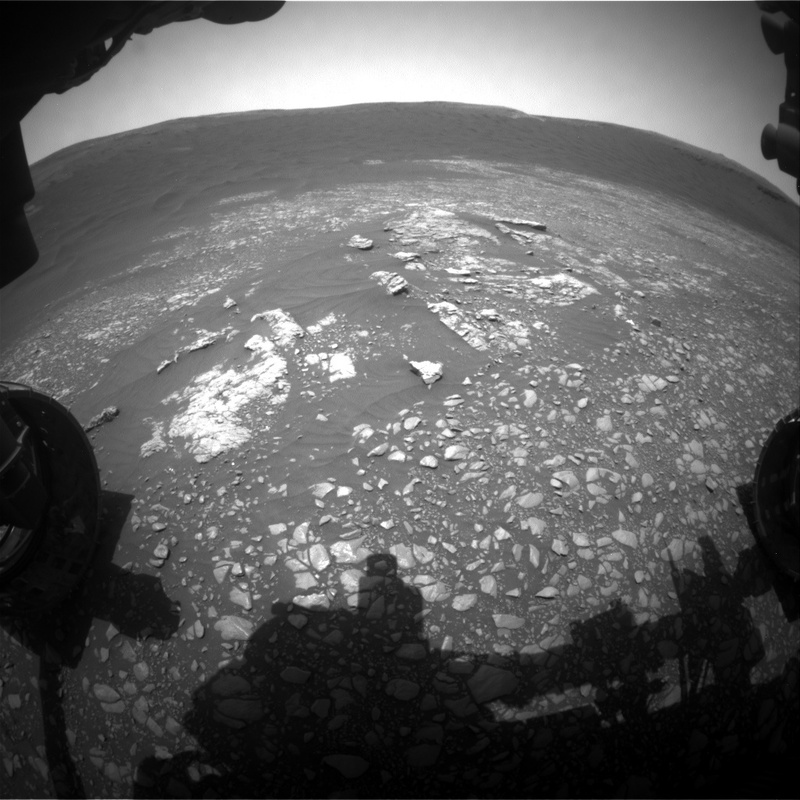 Navcam of the current workspace, with the potential drill site towards the back of the bedrock outcrop. One of the primary goals of the Curiosity mission, to determine the composition of a region which appears to be rich in clays (informally known as "Glen Torridon") is getting closer to being achieved. Our weekend drive was designed to bring us to an area of flat-lying bedrock, which we had hoped might contain a drillable surface. At the start of planning, we were very excited to see a larger, flat slab of bedrock towards the back of this outcrop, so we decided to maneuver around to that end of the outcrop, so that we can assess the suitability of this rock as a drill target. First, we will categorize the composition of the bedrock from the position that we are in. APXS will analyze "Longannet" to ensure that we are still within our desired compositional range, and MAHLI will image this target, for comparison to previous targets. ChemCam will analyze a comparable target called "Tartan." Mastcam will image Tartan and "Lumphanan," which may be a fragment of an iron meteorite. We then make a short drive (<15 meters) to the other side of this outcrop and take Mastcam imaging of the potential drill site. This will allow the engineers and rover planners at JPL to examine the bedrock in more detail and assess its suitability for drilling (for example, looking at rock coherency, presence of veins, homogeneity of the surface). These images will be downlinked ahead of the start of planning on Wednesday, so that we can make an informed decision. A key activity in this two-sol plan will be to clean the gas column in the "Sample Analysis at Mars" instrument (SAM), in advance of drilling and analyzing a new target. The Environmental Theme group (ENV) planned activities to continue the monitoring of environmental conditions. The Navcam will take a suprahorizon movie, looking southward at clouds and variations in the atmosphere, and a dust devil survey, which gives information on winds and air currents near the surface of the planet. We will also have the usual complement of REMS, RAD and DAN actitivies, continuing their comprehensive monitoring of weather conditions and radiation levels in Gale crater. Although our focus right now is on finding a drill site, we are always looking into the future too, trying refine our future drive directions. As part of this process, Mastcam will take images to document the path forward, looking at an area where we can see some coherent blocks of bedrock eroding off a resistant clay unit ridge, known as "Teal." This will aid the planning groups to identify areas of higher scientific interest, and to determine our path once we leave this part of Glen Torridon.